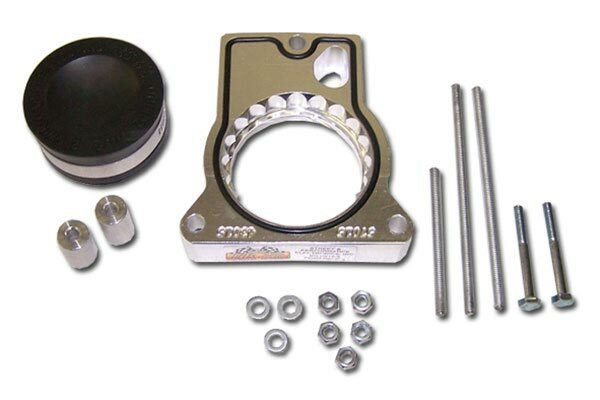 Taylor Cable 54015 - Taylor Cable Helix Power Tower Throttle Body Spacer - FREE SHIPPING! An excellent product and does exactly what it is intended to do. I definitely recommend this product for anyone that has a F-150. 08 F150 SuperCrew 4x4 5.4L stock with K&N 57 series intake. Had to rig the installation a little since I have a K&N intake that puts an elbow between the TB and the manifold. I still installed it on top of the manifold rather than directly behind the TB bacause there is a corkscrew lip that goes down into the manifold a bit. If installed behind the TB the lip would potrude into the elbow and actually disrupt proper airflow. I also had to use different length bolts than the ones supplied because they are for stock application. Before install I drove very conservatively for 1 tank in town and then again only Highway at 75 mph, both with 93 octane. In town I saw 12.5 mpg and HWY I saw 15.9 mpg. After install I drove the same test and saw 13.5 in town and 17.1 HWY. I did not expect to see any gains without having it programmed so I was surprised to even see 1 mpg. No difference in felt power or acceleration so dont get excited there. Good product, a little pricey, but it does in fact help. Just dont expect to see the 4 mpg change they advertise unless you have an intake, exhaust, and custom tune for your specific setup (if you don't often purchase aftermarket items, thats where they trick you with the numbers and use the words "up to" meaning you could possibly see said gains in perfect conditions on a slight downhill with other complimenting aftermarket parts). But once you have all the right peices, they work together nicely and you will see that 4 mpg gain. After reading forums that said throttle body spacers were nothing more than a paper weight and a waste of money I decided to try it our for myself. I already had a c.a.i. and let me tell you there has not been one second of disappointment with this purchase! The increase in throttle response is awesome and the amount of torque you can feel is quite impressive. I would say well worth the money. On a vehicle this size every little bit helps and this part makes a noticeable difference. This thing was so easy to install, and I like the little whistle it give the engine when your getting on it a little. Small MPG gain, but thats most likely more my fault than the power tower... So I'm going to put one on my wifes Lincoln Navigator too!! 8 of 12 people found the following review helpful. Shoty machining, over drilled diameter for bolts. Sloppy machining! No Debur on spacer. Rough edges I'm Lucy I didn't cut my hand trying to install it. The part does work but the over all quality could use some major cosmetic attention. If this part was coming out of my machine shop I would be embarrassed! Easy to install. Small HP gain. Cool!! 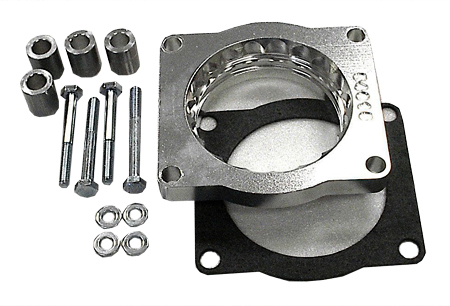 Upon receiving my new Helix Throttle body spacer, I have coupled it with a Volant Air Intake. The Helix required four long bolts to actually mount to my 2004 Ford 5.4. only two in kit, trip to hardware store. Once mounted and installed with Volant air intake tight fit at rear fire wall some vibration back into truck body. I do not like the constant high pitch whistle, and thus far no real gain in power or MPG, there is a fade out of power at high end, or a delay/slack at high speeds once you step on gas. There is also a vibration associated with this combination of parts, I have installed rubber washers under Volant air box and it helped but when turning or under load of giving it gas it vibrates bad. considering removing throttle body to see if different and get rid of whistle!!!!! return if possible. 7 of 13 people found the following review helpful. The Helix Power Tower throttle body spacer installed as instructed, and as advertised, does not have any annoying whistle. It helped with throttle response and I must say that the engine does run much smoother. Hard to tell at this time about fuel mileage due to driving in a lot of rough weather. As always, AutoAnything.com was great. Installation, very simple, however, on 2007 Ford Expedition two of four screws that hold the spacer to throttle body were too short because there is a thick bracket on all four corners, not just two as stated in directions. Otherwise, I added longer screws. Use: I noticed a quicker response of the low end rpms. My wife said there was something wrong with the Expy. She said the truck takes off so fast with hardly any gas. I never told her I installed it and she noticed the improvement. She also noted it likes to keep going after accelerator is lifted. Both of these are a good thing. MPG. I didn't really know what the mpg was before because I only had truck one month prior to install. On a 2000 mile trip to Canada through mountains, we averaged 17.5mpg. Nice for a 5.4L V8 while doing 60-75mph. I can't tell any power gain & gas mileage only went up about 2 tenths mile per gallon. Nice looking unit but I can't say it was worth the money. Nice results along with a cold air intake and real dual exhaust on my 2006 5.4 F-150. I waited until I used a tank of fuel for around town as well as an interstate trip to measure the miles per gallon improvement. Around town I noticed approx 1 mile per gallon improvement which represented approx 5%. At interstate speed I noticed approx 2 miles per gallon or almost a 10% improvement. The reason I purchased this to begin with was to improve the low end performance for the 5.4L motor. My truck had a throttle lag, but the Ford garage said everything was within factory specifications and they could not change anything. Well the low end response also improved, so that I no longer experience throttle lag. I installed the spacer in about half an hour and noticed the improvement immediately. Off the line and just driving down the road in general there is more response and not to mention the three miles per gallon I gained. 29 of 35 people found the following review helpful. I was hoping for more feel in the horsepower(topend). I did get a 2-3 mpg inprovement,and a snappier off the line response. My truck has leveling kit and 33x12.5x18, before this got 12-13 now 15 mixed driving. Overall, great investment. Reference # 761-762-694 © 2000-2019 AutoAnything, Inc.